MD - Anaesthesia and Critical Care Medicine, M.B.B.S. Dr. Ashwani Nayyar, M.B.B.S, M.D(Anaesthesia), an alumnus of the renowned Gurur Nnak Dev University, Amristar, is currently heading Cardiac Anesthesia and Critical Care Medicine Unit of Alchemist Hospital. Prior to that, he has career stints as a Chief Anesthesiologist and intensive care specialist at Tagore Heart Care and Research Centre, Jalandhar. Besides this, he has been associated with Manohar Lohia Hospital, New Delhi & Sri Guru Ramdas Hospital, Amritsar. Dr. Ashwani is having a rich experience of more than 14 years in Cardiac Anesthesia & Intensive Care and has a certification in the Fundamental Critical Care Course and Comprehensive trauma life support. He has handled thousands of cases of cardiac surgery, including Open Heart surgeries, Valve Replacement surgeries, Congenital Cardiac surgeries, Peripheral Vascular surgeries and Off Pump Coronary Artery Bypass Surgeries. To his credits, he has published & presented his research work in various national & international journals and conferences. 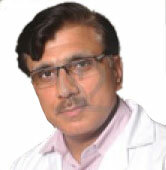 He is also bagged with Instructor for Indian Diploma in Critical Care Medicine Award.